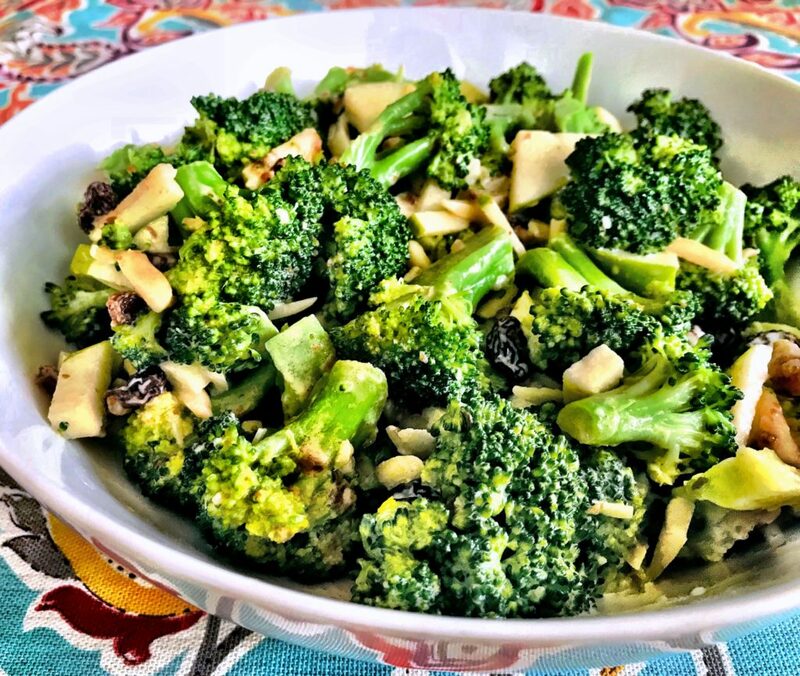 This Vegan Broccoli Apple Salad is hard to resist. It’s fresh, crunchy and flavorful. It’s a healthier alternative to the traditional Broccoli Salad, often prepared with dairy, granulated white sugar and meat. This is a quick and simple recipe to prepare using ingredients that you probably have on hand. It’s the perfect dish to take to a potluck, BBQ or to make for a casual dinner party, since it doesn’t get soggy. Cut the broccoli heads into small bite-sized florets. Save the broccoli stalk for another dish (a nice soup or smoothie). Blanch the broccoli - Bring a large pot of salted water to boil. Add the broccoli florets. Cook 1-2 minutes, depending on how crunchy you want the broccoli ( see notes). Transfer the broccoli to an ice bath ( large pot of water with some ice cubes). After 2 minutes, drain it well. Set aside. In a large bowl, combine the broccoli, apple, raisins and almonds. In a high speed blender, add all the dressing ingredients and process for 30 seconds. Add the dressing to the salad and toss to mix well. Serve immediately or refrigerate for at least 30 minutes. If you blanch the broccoli for one minute, it will turn bright green and crunchy. Two minutes will cook the vegetable through but still firm. More than two minutes, the broccoli will get mushy. I would suggest setting up a timer. This entry was posted in Recipes, Salads and tagged broccoliapple. Bookmark the permalink.